Gene Black an Alabama Artist and Quilter: C'mon and Rock my World!!!! Wow! I got home a bit later than usual today. I had to stop by Mom's and give her a B12 shot. I do that every two weeks. (and no, I am not a nurse or a doctor but I learned to do it) Then we went next door to see my Aunt and Uncle. My uncle had gotten his second eye operated on for cataracts on Monday. He is doing fine. So anyway, I got home and started the computer, and did a few small chores. Then I sat down and opened my email. I had at least 3 emails telling me that I needed to check FaceBook. Why? I seems I had won an AccuQuilt Go! cutter from the AccuQuilt people. HUH? They haven't reached the 5000 fans yet have they? No, not yet but you should go be a fan if you aren't already. No, I had entered the IHAN contest to win a Go! but Kelly hasn't drawn for it just yet. I wrote a limerick for her giveaway entry. Well I decided to post it on AccuQuilt's wall on FaceBook. I was tickled when I saw "AccuQuilt likes this"
The message on Facebook said " Gene - Very clever limerick! Please call Beth at 888-258-7913 Ex 611 to receive your Free AccuQuilt GO! Fabric Cutter. " Oh, ah...uh....OH MY!!! It was a couple of minutes before I could dial the phone. Then - "the office is closed for the day, but if you know your party's three digit extension you may dial it at any time." I dialed it and left a message..but my cell phone started ringing. Ha ha. Fortunately, I had an email address for Beth so I emailed and told her my phone number and mailing address. AccuQuilt is trying to increase the number of fans on Facebook ( www.facebook.com/accuquilt ) and that they give away GO!s when they reach various milestone numbers of fans. That is just so excellent! I know you will love it!! All right!! 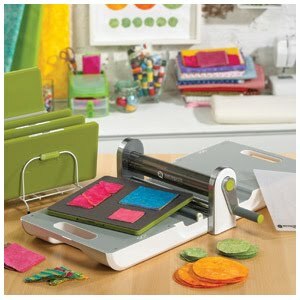 Congratulations - I'm so happy for you :) I can't wait to see all the creations that result from this little machine! Yeehaw - what a cool thing to come home to! Wow! I'm happy for you and Joanne. Dumb me didn't enter. Gene, that is totally awesome! Congratulations! And if you win from Kelly, then I know what you can do with the spare ;). SAAWEEET!! I tell ya you're lucky, you may deny it all you like but you can't run from the truth! So I'll be expecting a demo on the 14th. I'll bring the bread, you bring the GO! Congrats Gene...How neat is that! Can't wait to see what you do with it! Way to go Gene!!! I have been traveling and when I finally got home and set my computer up, I had received several messages about you winning a "GO"......so I had to click on over to your site and say "Man you are a lucky dog".....I have never found anyone luckier but I will say a very deserving person. I am sooooooooooooooooooooooooooooooo excited for you....this news made my day!! Congratulations Gene! I'm really very happy for you. I am still doing cartwheels for you (and that is NOT a pretty sight to see such an old, out-of-shape broad doing cartwheels), but.....my intentions are good!!! LOL You are really lucky.......but the others are right...well-deserved!!! Congrats Gene, what a great surprise. Once you get it you will need to make a quilt with it to show us. Congrats! That is awesome. I am waiting to hear I won from Kelly's Blog and for a minute there I thought you had! Congrats, Look forward to seeing your creations. Whoo Hoo way to go Gene! It pays to be clever. Congrats, Gene!! Can't wait to see what you create!! way to go Gene! Congratualtions and have fun with your Go! when it arrives. Wow. Can I rub your quilty parts for some good luck? or is it that I need to soak in your stash for awhile? *GRIN* Congrats to you! Well, I have "green" eyes -- I would love to have won it but....glad you did if I couldn't! Let us know how much you enjoy it! Wow! Congratulations! What a great surprise. I know you will have lots of fun cutting and creating with the die- cut shapes- It is always nice to see someone win who will enjoy the prize. Very cool, Gene! Love the limerick! I want a Go, too, but I need something for my husband to get me for Christmas so I will give him the info and he can surprise me on Christmas morning. This will allow him to go out and buy some tool that I will wrap up for him to open on Christmas morning and he will be surprised, too. :-) We've both been surprised by a couple of perfect gifts in the last few years. LOL! Aren't you lucky! Enjoy your new machine. I had never heard of this (being a new quilter, I'm a little ignorant on what's out there). I'm going to the facebook page and check it out. Thanks. WAY TO GO!!! Can't wait to see what you do with it! Way to go! I can't wait to see what you do with it!